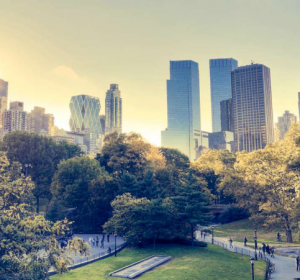 What lessons can we take from New York when it comes to navigating local microgrid utility requirements? According to a new Veolia white paper: The answer is quite a few. In the new report, Veolia, which focuses on optimized energy resource management, highlights how microgrids present a reliable, resilient, and cost-effective alternative for major energy users. That said, challenges still remain. One of the largest hurdles to tackle includes ensuring that utility infrastructure and regulatory frameworks are prepared to keep pace with industry advancements in energy distribution and microgrids. Elements include utility rate tariffs, franchise rights and requirements for electrical interconnection with the grid — just to name a few. Nowhere has this challenge been illustrated better in recent years than in New York, as the New York State Public Service tries to keep pace with energy industry advancements. 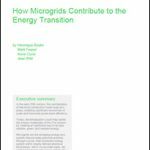 Microgrids represent a new concept that requires adapting existing frameworks. And now, as a result — with frameworks like REV leading the way — developers can work toward implementing distributed energy solutions, including microgrids, to provide more efficient and resilient power to NY residents. But this has taken close collaboration with local utility distribution companies — lessons learned that can now certainly serve to pave the way for similar future projects across the country. These relationships have to take into account the utility’s needs, as well as the developer, the community being served and more. For the utility, since traditional utility system infrastructure hasn’t been designed in a two-way power flow, these companies need to be included in the microgrid design process to ensure they can protect their system if multiple energy sources are connected to the larger grid. And for developers, these parties need to address requirements from the local utility early in the design process to ensure they can maintain seamless dispatch of energy to their site. And when designing a microgrid, there are a variety of local utility specifications for interconnection that need to be adhered to. This whitepaper from Veolia discusses the technical and economic implications of working with the host utility and how to navigate these requirements during project design and development. It also explores how project owners and utilities like Consolidated Edison, have partnered with companies like Veolia, and its energy consulting subsidiaries, to bring these complex energy projects to fruition. 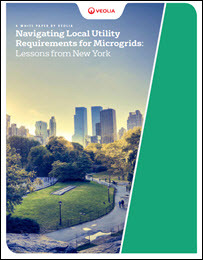 Download the new white paper from Veolia, “Navigating Local Utility Requirements for Microgrids: Lessons from New York,” to learn more about how to navigate microgrid utility requirements.